Talk about inflation. Tire prices are on the rise, and a lot of consumers aren’t going to be very happy. In fact, tire industry analysts like Saul Ludwig predict that the prices of wholesale tires will be 5-10% higher by the time the new year rolls around. But why? There are a few factors that are contributing to the rise in prices. First off, raw materials like rubber and oil are also rising in price, forcing manufacturers to charge more in order to maintain profit margins. Secondly, supplies are low as manufacturers remain cautious in the recessed global economy, and demand is high at a time when lots of consumers are in the market for snow tires. Simple Economics 101 tells you that low supply and high demand equals higher prices. Another contributing factor is the Chinese tire tariff recently imposed by President Obama. In light of the tariff, many manufacturers are raising prices in order to offset the hefty 35% tax. Goodyear was the first major tire manufacturer to announce a price hike. Starting December 1st, all Goodyear replacement tires sold in the U.S. will be subject to a 6% price increase. Cooper Tire has also increased its prices to offset the tire tariff. Industry analysts expect that the rising cost of raw materials will result in a 5-10% increase for Cooper across its lineup in 2010. Despite the surge of buying, tire shipments are still expected to drop in 2010, as the tire industry continues to suffer the effects from a hard hit automotive industry. Each year, the Rubber Manufacturer’s Association sponsors a week-long event that aims to raise awareness about tire safety and proper tire maintenance. In 2010, Tire Safety Week will be held from June 6-12. During this time, tire retailers, tire wholesalers, manufacturers, and other businesses in the industry are encouraged to participate and help spread the word about tire safety. Many participants use this awareness week to promote their own businesses with advertising, specials, and in-store promotions. It really is a great way to help not only your business, but the general public. More than 21,000 dealers and shops participated in the event last year. If you’d like to get more information about National Tire Safety Week, visit the official web site at http://www.betiresmart.org. If you do choose to participate, the RMA will send you a bunch of materials that will help you organize and plan your own campaign. You’ve got plenty of time to plan – but don’t procrastinate and miss out on this great opportunity for publicity and education! Hankook unveiled their latest all-season tire at the annual SEMA conference in Las Vegas. Consumers looking for a strong, lightweight and fuel-efficient tire have a new option in North America. At the Specialty Equipment Market Association industry trade show in Las Vegas, Hankook unveiled their newest all-season tire: the Optimo H724. According to director of brand communications Bill Bainbridge, the new tire delivers a safe and comfortable ride, as well as all-season traction and mileage that one would expect from more expensive tires. The new tire features improved carcass construction and a more durable tread compound that lasts longer than other tires at comparable price points. Not to mention, the new tread design performed well in hydroplaning tests and has been extensively tested well above the normal standards for snow traction control. Consumers looking to purchase the new all-season Hankook H724 can expect all 38 sizes to be available early next year. Contact your local tire wholesaler for availability and pricing. Snow tires can make a serious difference for you, your vehicle, and other drivers on the road this winter. Winter is fast-approaching and many areas of the country have already seen the first snowfalls of the season. The cold weather often comes hand-in-hand with treacherous driving conditions, and paying attention to your tires could make the difference between a safe or dangerous winter for you, your vehicle, and everyone else on the road. 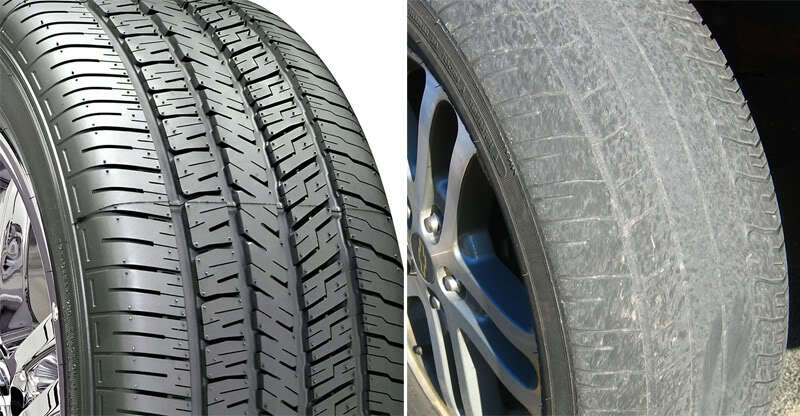 Here are some basic winter tire tips to keep in mind as the temperatures begin to drop. Keep your tires properly inflated. Don’t skimp when it comes to maintaining proper tire pressure in the winter. The cold weather and temperature fluctuations will cause your tires to lose air faster than normal, and an underinflated tire on a slick road is never a good scenario. Make sure to check your air pressure every time you fill up your tank at the very least! Switch to snow tires. Perhaps the best way to stay safe on the road this winter is to have snow tires installed on your vehicle. These special tires feature treads that are engineered to provide the most amount of grip and traction in the snow. All-season tires just won’t cut it in parts of the country that see lots of the white stuff every year. While snow tires are designed to retain their elasticity in cold temperatures, regular tires harden up and lose their ability to hold onto the road surface. If you do decide to use snow tires, don’t mix and match – go with 4 tires to get the most performance out of your investment. Make sure your tires are in good condition. If you’ve decided to forego winter tires this year, or if you’re re-installing last year’s winter tires, make sure to check the treads to ensure they are in good condition. You can use the penny test to make sure that the tire treads are deep enough. Aside from the penny test, just look for any gouges or damage to the rubber. You don’t want to be driving on tires that are going to explode on impact with the first pothole of the season! Winter driving demands equipment that can handle the job! Don’t skimp on important safety measures like snow tires this year – if your tires help you avoid just a single accident or fender bender, they’ve easily paid for themselves. You’ll also get increased peace of mind the whole winter long. For access to a complete inventory of wholesale snow tires, contact Future Tire at 516-752-9200. The RMA has revised it's 2009 tire shipment estimates, and the numbers don't look very good. It seems that for every good piece of news we see these days, there’s a not-so-good one that follows soon after. Today is a not-so-good day, as the RMA (Rubber Manufacturers Association) has posted its 2009 tire shipment prediction: a 13% drop (282 million units to 246 million units). This decrease in tire shipments can be traced directly to sharp decreases in demand for wholesale OE tires and commercial truck tires. Tire shipments peaked at 321 million units almost 9 years ago. Since then, low consumer confidence and high unemployment rates have made it extremely difficult for the automotive industry to maintain stable growth. Despite the current state of the economy, both the consumer and commercial sectors appear poised for a rebound in 2010. If the economic pendulum does swing back the other way, the tire industry could see 6% growth this year, reaching the 260 million unit level. OE passenger tires: Decreases in domestic vehicle production will result in a 43% drop in OE passenger tire shipments. OE light truck tires: 9% decrease expected, followed by little or no growth through 2010 as domestic vehicle production remains weak. Replacement passenger tires: 6% decline followed by resumed growth in the next fiscal year (nearly 3% rebound is expected. Replacement light truck tires: 11% drop, little or no growth expected in 2010.